For butterfly aficionados, anything bringing their beloved subject matter into the house makes for welcome decor. 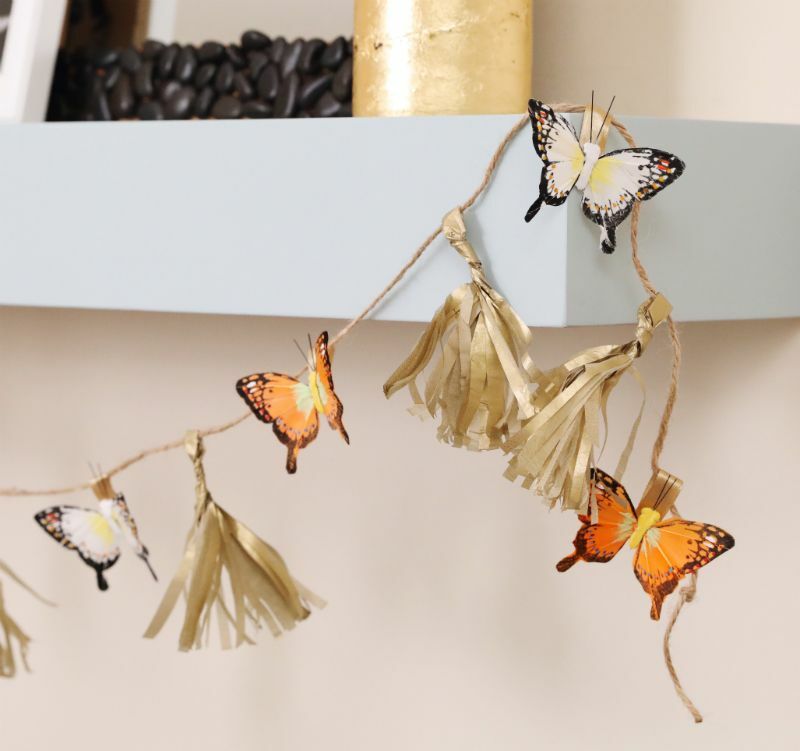 A butterfly garland with the addition of golden tassels invites a glimmer of sunshine into any room, and there is no need to spend an hour cutting out numerous butterfly shapes. 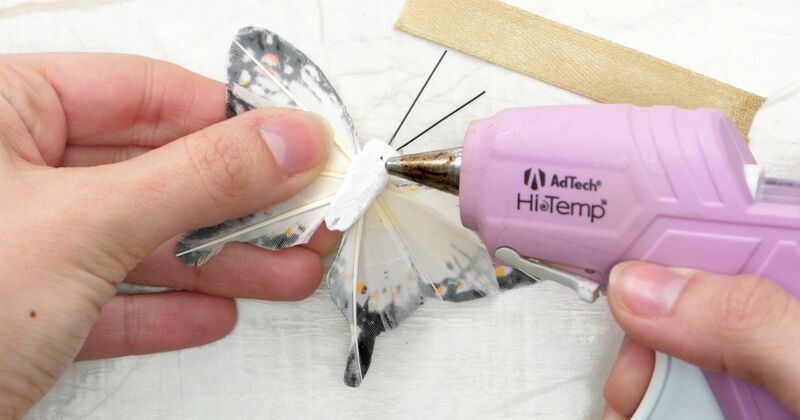 Realistic butterflies are just a trip to a craft store away. If this garland is strung along a shelf or mantel with rough edges, the twine will catch on them, so there's no need for hooks. If the surface where you plan to string the garland is smooth, invest in removable wall hooks so you can move the garland to different rooms, if desired. Keep the garland away from humid areas such as the kitchen and bathroom as moisture could weaken the tissue paper. 1. Cut off 3 inches of ribbon. Fold the ribbon in half so it forms a loop. Place a drop of glue on the inside of one end and press the ends together. Let the glue dry. Repeat this step for as many butterflies as you plan to have on the garland. 2. Place a dab of glue on the back of a butterfly's body. Press the closed portion of a ribbon loop to the glue. Let the glue dry. Repeat this step for as many butterflies as desired. Set them aside. 3. Unfold one sheet of foil tissue paper—it should open into thirds. Cut along the length of one seam. If it does not open into thirds, cut off a 12-inch by 4-inch piece. 4. Fold the rectangle in half so the short edges meet. Turn the rectangle so those short edges are at the bottom. Cut 1/8- to 1/4-inch fringes three-quarters of the way up from the bottom. 5. Unfold the rectangle, and place it horizontally on the work surface so the fringes are on the left and right sides. Fold over and crease the foil 1/8- to 1/4-inch; fold as wide as you cut the fringe. Continue folding and creasing until you reach the end of the foil. 6. Fold the foil in half so it forms a loop at the top. Twist the loop a few times near the loop's base to hold it in place. 7. Repeat steps 3 through 6 until you have a number equal to that of the butterflies. 8. Cut a length of twine equal to the desired garland length plus 8 inches. Double-knot the right end. Slide on one butterfly followed by a fringe loop. Continue this alternating pattern until all butterflies and loops are threaded onto the twine. Double-knot the left end. 9. Drape or hang where desired.